You're a runner reading this? 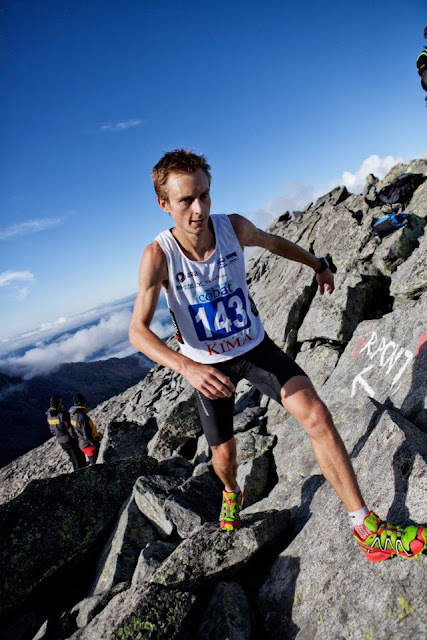 If so, then add the Kima Sky Race to your list of TO DO VERY SOON races. That is, on the small caveat that legging it up a 2000m climb, then jumping from rock to rock for four or five hours is your kettle of fish. Don't worry, you do get a break from this relentless rock-hopping. 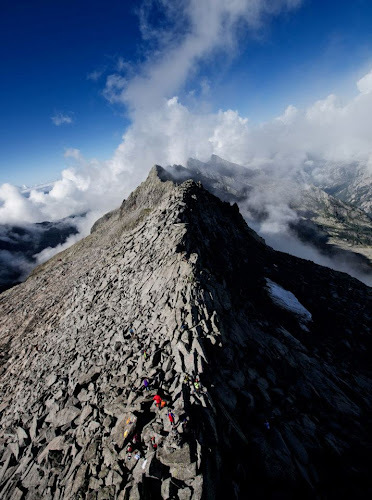 Yes, every half-hour or so, as you pass over one of this classic walking route's seven steep-sided cols, you can test out your scrambling skills and heave yourself up the pass's near vertical walls. You will be greeted at the top by a more appropriately dressed man than you. He will be wearing an awful lot of clothing, his hands will be hidden in gigantic cloves, he will be wearing a harness from which a rope dangles and secures his body to the rock face behind. As you approach the man on the perilous outcrop of rock, he will point with one out-stretched hand downwards and to the right, he will cry out "FORZA !!" and leave you to stare down into the gaping void and wonder, "how the heck am I gunna get down there then, ya what??" Quickly you see the chain, grab it, and jump, slide, scrape, fumble, tumble.. (or perhaps do it in a more elegant manner?)... Safely at the bottom you're back to rock-hopping for a while, in await if the next interesting vertical obstacle. This is what I call fun! It is real and pure Sky Running. 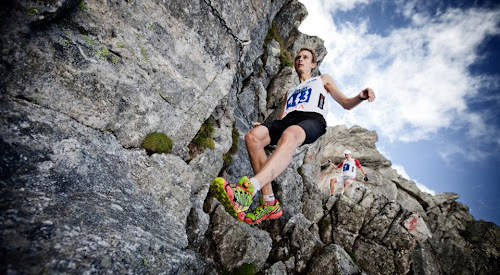 The sport's origins lie in these valleys and there's a impressive number of similarly designed races within a very small radius of Val Masino, the base for the Trofeo Kima. I've done a few of them now and I always have a great day out on the hill. You can only smile and enjoy these courses. The running terrain is incredible and the scenery mainly composed of impressively pointy rocks. These races take you close to and sometimes over this jagged skyline. Race day then. After a brief meteorological scare, evidence of which was the river of rocky pools in front of the hotel, which I'd bathed in the day before and which had overnight turned into a raging torrent of choppy, white rapids. The start was pushed back half an hour, the organisation checked the score, announced that all was good to go, and the runners were let loose. Due to a painful hip, I've been limited to jog-plodding through the months of June and July. There's been no quality fast running in the mix. And as a result my early-year form has long since departed. 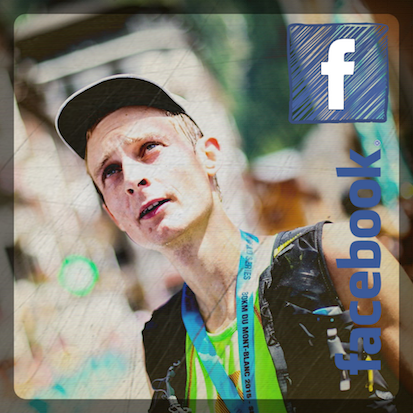 The reality of my powerless quads was brought home two weeks ago when I struggled my way around the 42km Salomon Ubaye trail race. So I really wasn't expecting much of a result at the Kima and set off in a completely non-competitive mindset. I just wanted to enjoy this one and if the legs could hold up then that would be enough of a success. I ran just behind the top ten up to the top of the first pass. It was a tough climb and I would have been powerless to go with the front of the race even if I'd wanted to. Down the first set of chains and onto the boulder fields then. Let the fun begin!. Over the course of the next three to four hours, as I counted off the seven passes one by one, some sort of strength and energy returned. (That would not happen in a 50km road race!). 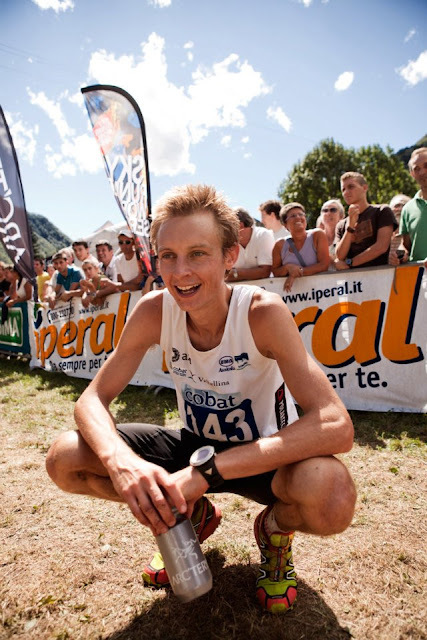 I pulled through to seventh place and then ran with young German trail star, Philipp Reiter, for the next few hours. 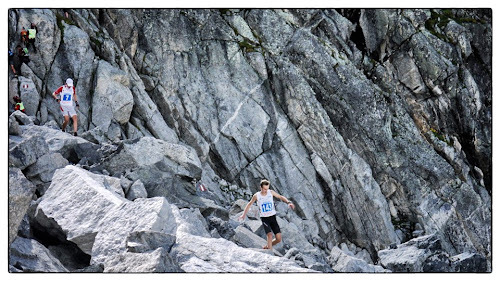 Towards the end of the high section I let loose a little, left Philipp, ran past fellow Salomon France man, Michel Lanne, and into fourth. I actually felt like I was racing again. I made a vague attempt to pull back third place over the final hour, but it was an Italian ahead, they can generally descend well, and my attempts were to no avail. All in all though, a totally positive outing, all things considered. Next up then. More drastic changes of scenery are on the cards. In three weeks time I'll be up in the north west of France, running around the coastline of what's supposed to be a very pretty island, as per the name, Belle Île. Hip healed (I think), I'll be trying to squeeze in some quality between now and then. Ciao to Italy until next year then. I'll be back. I do love your cappuccinos and your mountain races!..